Witches Wealth Video Slot Guide & Review - Casino Answers! Witches Wealth is a 5-reel, 9-line video slot developed by Microgaming, featuring a wild symbol, scatter wins and two bonus games. You can play the Witches Wealth video slot at Bovada. Coin sizes on the Witches Wealth slot machine are $0.01, $0.02, $0.05, $0.10, $0.20 and $0.25. You can select from 1-9 paylines at 1-20 coins per line. The lowest bet you can make on the Witches Wealth slot game is a penny per spin up to the highest possible total bet of $45 per spin. For a 9-line video slot, Witches Wealth has a good betting range for low and high stakes slots players. To play all 9 lines and all 20 coins per line, hit the “Bet Max” button. For all other bets, you can hit the “Spin” button to play Witches Wealth. The highest paying symbol on the Witches Wealth video slot is the Serena the Witch symbol. 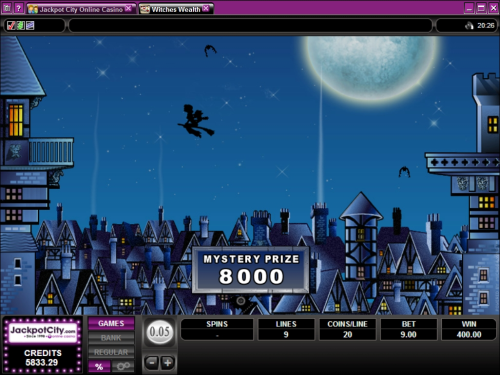 If you hit 5 Serena the Witch symbols on a selected payline, you will win the 6000 coin top jackpot. Serena the Witch is the wild symbol on Witches Wealth and will substitute for all symbols except for the Mr. Twinkles bonus symbol. The Owl symbol is another high paying symbol on Witches Wealth and can pay up to 2000 coins. Witches Wealth’s scatter symbol is the Bat symbol. 3, 4 or 5 Scattered Bats will pay out 2X, 12X or 50X your total bet. Scatter wins are added to payline wins. Witches Wealth features a double bonus feature. When 3 or 4 Mr. Twinkles symbols appear on an active payline, you will trigger the Spinning Wand bonus game where you can win up to 1600 coins. In this wheel bonus game, you will get to spin the magic wand to either land on a prize or to activate the Flying Rescue bonus game. The Spinning Wand bonus game is triggered frequently when you play the Witches Wealth video slot at Bovada. If 5 Mr. Twinkles bonus symbols land on an active payline or if the magic wand lands on “Bonus” in the Spinning Wand bonus game, you will trigger the Flying Rescue bonus game. You can win up to 16,200 coins in the Flying Rescue bonus game. The first part of the bonus game is that you will click on Mr. Twinkles to be awarded a mystery bonus prize. From there, it seems that Mr. Twinkles has teleported onto the wrong building. Serena has to get on her broomstick and fly over to the other building to get him, while dodging falling pianos, chairs, cows and all sorts of random objects. If she makes it across successfully to rescue Mr. Twinkles, your mystery bonus prize will be doubled. Once she gets him, she of course has to make it back home. If she makes it back across successfully, your bonus prize will be tripled. The bonus game is not based on skill, meaning you simply get to watch and hope she avoids the falling items. All wins pay left to right, except for scatters (which pay any). Only the highest win per selected payline is paid out. All wins are multiplied by the bet per line (except for scatter wins). Wins shown in bonus games have already been multiplied by the initiating line bet. Bonus wins are added to payline wins. Switch Witches Wealth over to “Expert” to gain access to its autoplay mode. You can hit the “5X” or “10X” buttons for quick autoplay spins or you can hit the “Auto Play” button for advanced settings. You can play 5, 10, 25, 50, 100, 250 or 500 autoplay spins and set the stop settings either to stop once all spins are complete or stop if a win exceeds or equals $100, $500, $1000, $5000 or $9999. Autoplay will stop on any feature contained in the slot game. You can stop autoplay at any time. With two bonus games ranging from OK to very good along with an interesting theme and good payouts, we think Witches Wealth is a strong offering from Microgaming. You can find out for yourself how much you like by signing up and making a deposit at Bovada! Is there a free Flash game of Witches Wealth available to play? 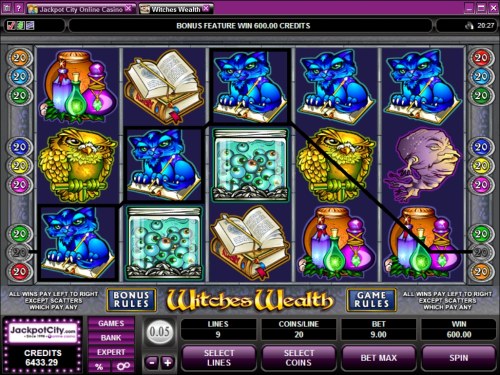 Yes, you can play a Flash game of the Witches Wealth online slot at Bovada. You can play for free or play for real money if you like. If you experience difficulties with the Instant Play Flash software, try downloading and installing the latest version of Adobe Flash Player. Can players from the United States play Witches Wealth for real money? American players cannot play the Witches Wealth slot game for real money at this time. For a couple of Halloween video slots you can play, you can check out Scary Rich and Scary Rich 2 at Vegas Days Casino or read our Vegas Days Review. How do I trigger the bonus features on the Witches Wealth video slot? The first bonus game (“Spinning Wand”) is triggered when you hit 3 or 4 Cat symbols on an active payline. The second bonus game (“Flying Rescue”) is trigger either during the Spinning Wand bonus game or if you hit 5 Cat symbols on an active payline in Witches Wealth. If you haven’t had enough witches and want to read more Halloween-themed slot game reviews, please read our list of Halloween slots.